Tiscali has told TechRadar that it is already doing its utmost to ensure that users are aware that their internet connection may vary hugely from the maximum advertised rate. The news follows BT’s statement that more needs to be done by internet service providers (ISPs). Guy Bradshaw of British Telecom’s Wholesale told the BBC that the ISPs and Ofcom need to draw up the most appropriate way to tell people that ‘up to’ generally means ‘well short of’ when it comes to broadband speeds. 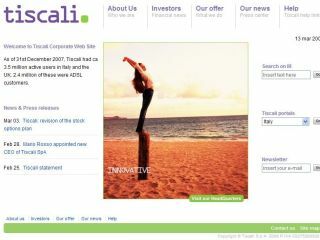 However, Tiscali, one of the fastest rising ISPs have responded to the claims. “I think the point is that most of the major isps are doing very similar things in terms of marketing,” Tiscali’s Director of PR & Communications Jody Haskayne told TechRadar.com. “With the wide range of broadband packages in the market there has to be some form of definition between the features of those products. “The majority of ISPs are marketing ‘up to 8 Meg’ and obviously the range of speeds that can be achieved is varied dependant on a range of things, but mainly the distance to the exchange. “I don’t really know where BT is coming from on this – within two or three clicks of the customer coming on to our site we give them a speed check based on phone-number that tells them the likely speed. That information is provided and maintained by BT.